Gabor Dornyei is one of the most in demand and successful Solo Artists, Session Drummers, and Drum Clinicians/Educators of his generation who emerged out of Europe in recent years. Gabor’s diverse talent led him to perform all around the Globe, including USA, Asia, Africa, all over Europe & UK, Scandinavia, Russia and countless other places. This outstanding drummer performed at the London Jazz Festival, Sziget Festival, Glastonbury Festival, Love Supreme, London Latin Jazz Festival amongst hundreds of others and participated in the London production of MJ Thriller Live World Tour for three consecutive years. The UK resident drummer and band leader has been listed and shared the stage with some of the World’s leading drummers, such as Billy Cobham and Gavin Harrison at Dresdner Drum Festival, Steve Smith and Ian Paice at Adams Drum Show in the Netherlands, with Steve Gadd, Marvin Smitty Smith and Terry Bozzio at Opole Drum Fest in Poland, Peter Erskine, Gregg Bisonette and Thomas Pridgen at London Drum Show, Chris Coleman in Moscow, Jojo Mayer in Hungary and at many-many other major international Drum Shows. As solo recording artist Gabor released three critically acclaimed DVD-s, 1. “Drums, Music and Friends” 2.“Thunder Duo (feat Kornel Horvath) with Dom Famularo” (digitally available from Hudson Music NYC) and 3.“Rhythm Frontier” -featuring world percussionist Pete Lockett- and also released two CDs under his own name. As session player he’s contributed to over 100 albums, including Gold and Platinum selling pop-rock albums and several cartoon and movie soundtracks for Walt Disney amongst other UK/EU sessions. One of Gabor’s real passions is drum education, and he’s achieved a “Master’s Level 7 PG Cert qualification at the University of East London (UEL) and he's been awarded with FHEA (Fellow of Higher Education Academy in the UK). 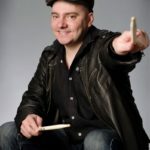 He’s Head Of Drums at DIME-ONLINE (Detroit Institute of Music Education-Online UK/USA), drum faculty at ICMP-London (The Institute of contemporary Music Performance) and Visiting Professor at the SWISS DRUM Academy (SDA). He's educating his private students at GABBEY ROAD Studio, London via Skype (from all around the globe) or in person in North West London, UK..
His Drum Clinics and Masterclasses are also hugely in demand, he’s held packed events at the Los Angeles Music Academy (LAMA), University of Southern California(USC), ICMP, BIMM, TECH, ACM, Drumsense, etc in the UK, Berlin Drumtrainer, Hamburg School of Music, Frankfurt Music Academy and Salzgitter Drummer Meeting in Germany, Swiss Drum Academy, Croatia Drum Camp, Slagwerkkrant Drum Fest Netherlands, etc..amongst hundreds of others. His two most recent solo filming “ Moving Around The Kit” on DRUMCHANNEL in Los Angeles, California, USA (with Don Lombardi) and “Percussive Drumming and Independence” on DRUMEO in Vancouver, Canada has brought him worldwide success, but even before that the global drumming media constantly featured him over the last decade as well. He’s been interviewed in Modern Drummer Magazine, Rhythm, Drummer, Drums&Percussion, Batterie, Drum Club, Stick Magazine, Top Drummer, Perkusysta, Slagwerkkrant and lots more. In 2016 Gabor started performing several international jazz festival Headliner Performances with American guitarist-multi instrumentalist Stanley Jordan. In 2017 Gabor’s film at DRUMEO has been listed between the “ Top 10” together with artists such as Peter Erskine, Bernard Purdie and Billy Cobham amongst others. Gabor Dornyei is worldwide endorser of: PEARL Drums, ZILDJIAN Cymbals, REMO Drumheads, VIC FIRTH Drumsticks, TYCOON Percussion, ROLAND V-Drums, HARDCASE, KICKPORT and SKYGEL.